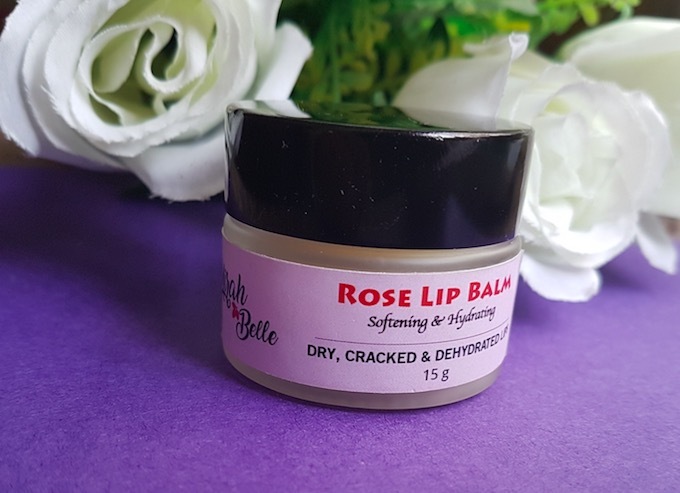 Hello everyone, today I am sharing the review of the Mirah Belle Rose lip balm that I’ve been using for the past few weeks. My lips become quite dry during the winters, and if not taken care, they become flaky and painful. 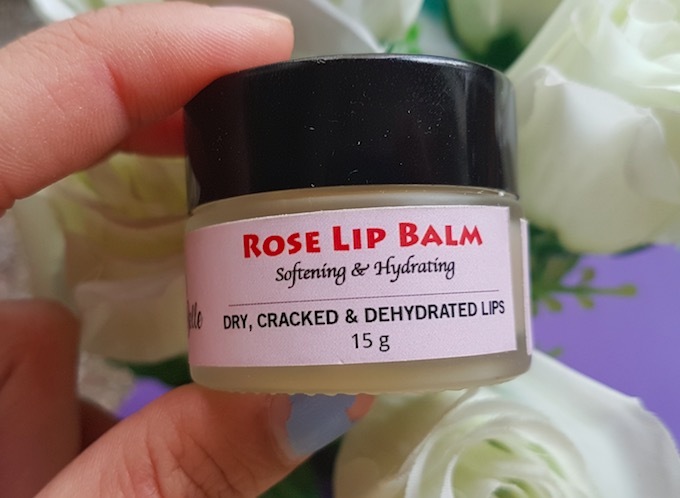 I always make sure to use more hydrating lip balm during the night time to keep my lips soft and supple. 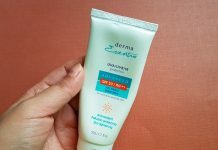 I have tried many lip balms from favourite brands like Kama Ayurveda, Forest Essentials, Vaseline, Lakme, Neutrogena, and Maybelline. However, I always find myself getting back to the all-time favourite Vaseline petroleum jelly, especially during the winter season. 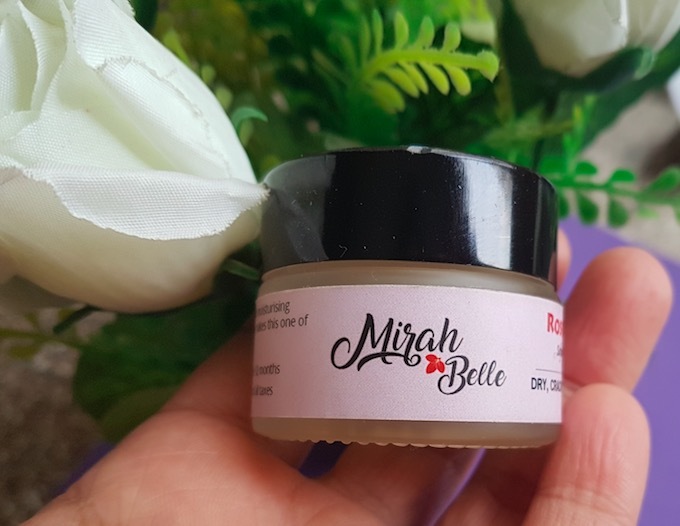 My Experience: The Mirah Belle Rose lip balm comes in a small glass jar with a screw cap and an inner lid. 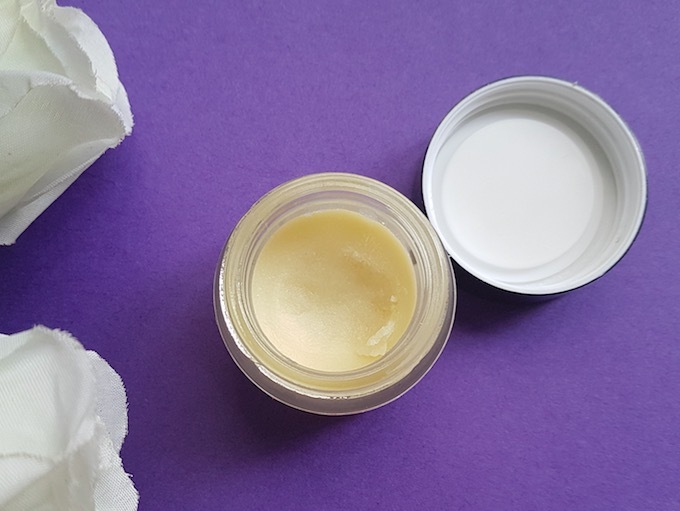 Inside the pot, there is an off-white colour product that looks almost like solid butter, though, the texture of the lip balm is not very smooth like butter. You can feel very fine granules that melts into a clear oil when rubbed on the lips. 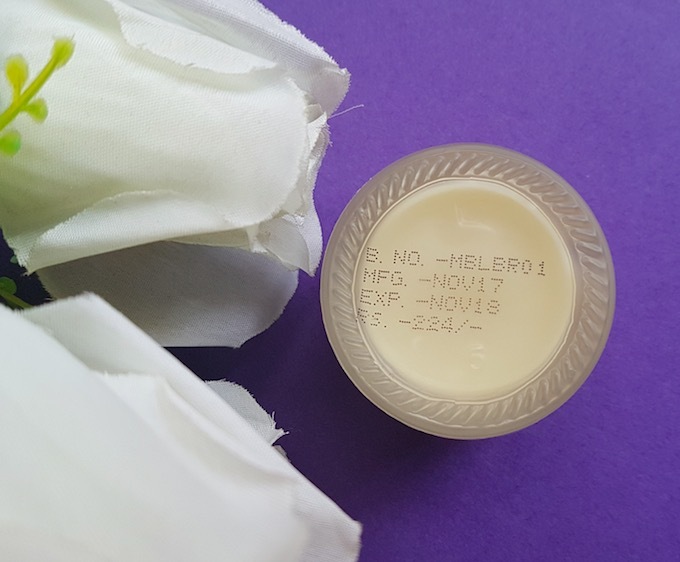 The lip balm has a rose essential oil scent that feels a little overpowering when you open the lid (personally I like its rose scent). However, the strong fragrance subsides within few minutes of application. I scrape out a small amount of the lip balm with my finger and apply it directly on the lips. The tiny granules have a mild exfoliation effect, and you can feel the warmth & tingling sensation on the lips. It instantly moisturizes the dry lips and feels very light on the lips. 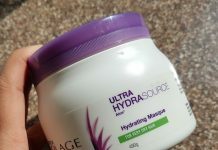 It doesn’t sink completely into the lips and feels like you have applied coconut oil. I’ve been using it religiously before bedtime since the day I received it, and every morning I wake up with soft and nourished lips. I don’t like using it during the day (I found stick-form lip-balm more hygienic and convenient to use on the go). 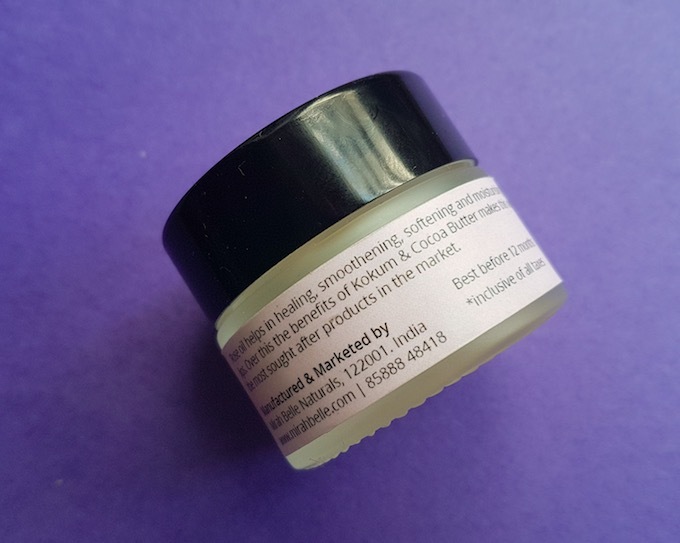 A 100% organic lip balm, enriched with rose oil, almond oil, beeswax, vitamin E, kokum butter, shea butter and cocoa butter. 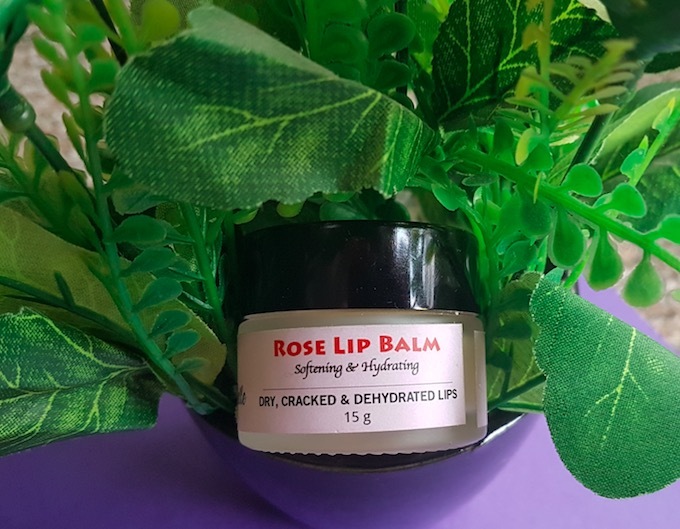 It heals dry, chapped and flaky lips leaving the lips soft, supple and nourished for long. It has a non-sticky formula and feels very light on the lips. Highly moisturizing and it can act as an excellent night treatment for dry lips. It has no weird taste. The quantity provided for its price is pretty good. A non-tinted lip balm ideal for both men and women. 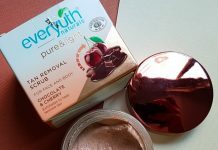 After talking to the brand, I found that all Mirah Belle products are sulphate and paraben free. I think they should have mentioned this in their products though. A jar container is not considered very hygienic and convenient to use, especially when travelling. Its scent is slightly on the stronger side, that can bother people who are sensitive to strong fragrances. Mirah Belle Naturals is an Indian beauty brand that offers a wide range of Organic skincare and hair care products. Their mission is to use fresh, sustainable ingredients to craft wholesome, safe, natural and effective skin and hair care products free from artificial ingredients and harmful chemicals. And to use the power and simplicity of nature to cleanse, soothe, heal and protect your skin. The price of the lip balm is Rs.224 for 15g. Mirah Belle products are available online at Nykaa.com and Flipkart.com. You can also buy Mirah Belle products from their official website mirahbelle.com. 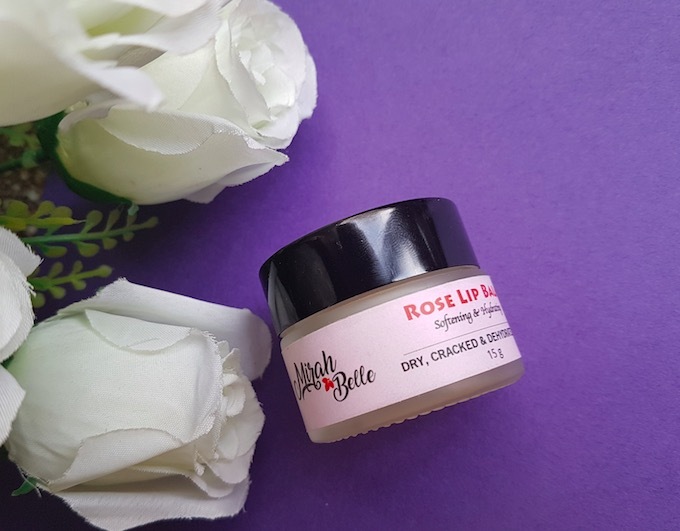 Overall, I really liked the Mirah Belle Rose lip balm for its moisturizing action. It provides intense hydration leaving the lips soft and nourished. This lip balm seems almost like the Forest Essentials Rose lip balm, however at much less price. Recommended!